Aaron Adams (Anaheim Storm) delivers a pitch during a recent JAL XVII pre-season game. Sixteen years ago this past October, the A-Bros of Ventura, California – fresh off of an undefeated regular season – swept the Lakeside Kings at Lakeside Park in Granite City, Illinois to win the inaugural USPPBA National Championship. The A-Bros success that season opened many eyes to the fact that quality competitive fast pitch Wiffle® Ball exists everywhere, not just in the traditional hotbeds. That fact was further hammered home when the Arizona Vipers won the 2002 national title and then repeated in 2003 by defeating the Tracy Shockers in the first all West Coast National Championship game. The lesson from those three years was clear – quality Wiffle® Ball exists everywhere, whether we know about it or not. A decade and a half later, the once vibrant fast pitch scene in California and Arizona that was cultivated by the USPPBA and Fast Plastic is unfortunately all but gone. A little further up the coast, however, exists a burgeoning Wiffle® Ball league that is once again reminding the rest of the country that great Wiffle® Ball – both leagues and players – exists all over, even under seemingly the least likely of circumstances. What are you doing December 23rd? Last minute Christmas shopping? Traveling home for the holidays? Staying indoors to beat the cold? How about beginning a twelve team, eight-game, five-month long outdoor Wiffle® Ball season? 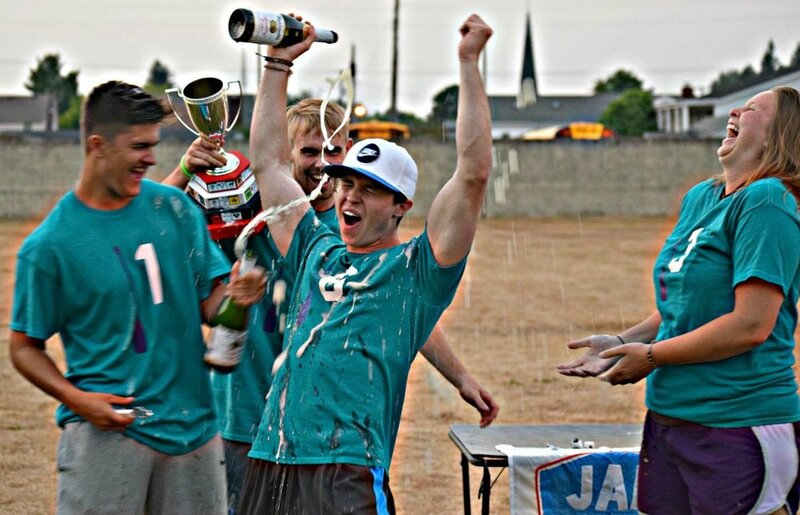 That is precisely what a group in southeast Washington State will be doing when JAL – the Pacific Northwest’s premiere Wiffle® Ball league – kicks of its 17th season with a full slate of games a mere two days before Christmas. Unconventional? Sure, but that is par for the course for a league that has quickly – and somewhat quietly – blossomed into the country’s most ingenious Wiffle® organization. From its unique gameplay rules to its forward-thinking league and season formats to its expert utilization of social media, JAL is blazing its own trail in the Wiffle® Ball world. Connor Vermilyea (Cobras) at the plate during a JAL XVI game this past summer. Cale Johnson – the twenty-two year old founder and Executive Commissioner of JAL – concedes that he never played much Wiffle® as a kid. He didn’t pay the iconic plastic ball much thought until one serendipitous spring afternoon three years ago in his hometown of Castle Rock, Washington. On that day Cale and his younger brothers, Brock and Ty, were in search of something to help pass the time when they found a couple of Wiffle® Balls laying around in the yard. The impromptu practice proved to be enough fun that Cale organized a two-man five-team tournament later that May. Just like that, JAL – officially the Johnson Association of Lawnball – was born. That first tournament led to a sequel one week later and a third a week after that. Cale and his brothers were hooked. As fun as those first three tournaments were, they envisioned something greater than a series of one-off events. Cale looked for a way to tie together what – to that point – were a series of unrelated single tournaments. Borrowing a page from the more ubiquitous national pro sports leagues Cale, dreamt up the JAL Franchise concept. He convinced family members – his grandmother, mother, father, and brother – to act as the “owners” of four teams and tasked them with filling out their respective rosters. The franchise system – complete with contracts, a “stock money” system designed to bring parity to the league, and a detailed Collective Bargaining Agreement – added much needed continuity to the organization. JAL held five more tournaments that August, followed by single tournaments in October, November, and December of 2015. By the time of the December tournament (JAL XI) – held two days after Christmas – the league had grown to six franchises and approximately 20 players strong. Two and a half years after its modest beginnings, JAL is about to embark on its 17th season. The league has exploded in popularity and now boasts twelve franchises with three to five players per team. The single day events have been replaced by multi-week seasons. JAL XVII, for example, will run from December through the middle of of May. Franchise owners pursue free agents and offer nominal incentives – the highest paid player in the league will earn $150 over the length of his three year contract – as a means of enticing them. There are several seasons played each calendar year, not including the Association’s innovative Smashout concept,which is described as “homerun derby meets the UFC”. JAL offers a full a full scale Wiffle® Ball league experience that few leagues anywhere in the country can match. A social media graphic hyping the start of the JAL XVII season. Proof of the league’s tremendous growth is found in the evolution of its recruitment process. As would be expected from a startup family league, JAL rosters were initially made up friends and family members of Cale and his brothers. As the league gained traction, the player recruitment process was aided by positive word of mouth. Recently prospective players have begun to discover the league on their own. Players from as far north as Olympia and as far south as Vancouver learned about the league online and now make the hour drive to Castle Rock to play. Due to the franchise structure of JAL, interested players must catch the eye of one of the franchise managers to join the league. This is often accomplished by submitting a scouting video to the league, which is then distributed to the franchise managers for review. If a manager likes what he or she sees, the player is signed to a contract. These free agents are finding JAL in large part due to the Association’s professional and far-reaching social media strategy. In a sport that is often playing catch up to the rest of the world in terms of technology, JAL stands out for its relative mastery of digital marketing. JAL utilizes a multitude of social media tools to garner interest in the league. Whether Facebook, Twitter, Periscope, Instagram or a traditional website, JAL has all of its digital bases covered. The JAL website – although unassuming at first glance – contains a treasure trove of information just below the surface, all of which is carefully interwoven. An outsider can stumble upon JAL’s website and in a matter of minutes find themselves digging down a rabbit hole of franchise histories, player bios, tournament results, and player contracts. The website accomplishes this by seamlessly integrating Google docs with traditional web pages. On the social media front, JAL stays active on Facebook, Twitter and Instagram by posting info-graphics, promotional materials, pictures, and video clips on a daily basis. In particular, the graphics stand out due to their creativity. With the help of a green screen, JAL has an almost endless supply of player profile pictures and graphics at their disposal to use for any occasion. When star player Scott Coleman left the Longview Wrecking Crew to join the Missouri Express after JAL XVI, the organization wasted no time in posting a short clip to Facebook of Coleman modeling his new uniform while the background behind him slowly changed from the Wrecking Crew team logo to the Express’ emblem. Players in and out of JAL’s home market can easily follow the league online thanks to streaming video. Every single game during the JAL XVII season this winter and spring will be streamed live on either Facebook or Periscope. Watching a JAL live stream is made even easier by the fact that games rarely last much more than 15 minutes. While four to six inning games in other organizations typically run anywhere from 45 to 75 minutes, five-inning JAL games breeze by in a fraction of that time. How do they do it? The brief run time of JAL games is all thanks to the league’s unique method of game play, known simply as Lawnball. At first glance, Lawnball rules are not dramatically different from the rules competitive Wiffle® Ball players in other parts of the country are accustomed to. The pitching distance (45 feet from the strike zone) and the strike zone dimensions (24 inches by 30 inches, 21 inches off of the ground) are within the usual parameters. There are no speed restrictions on pitchers and lines designate hits. While a Wiffle® Ball used in a game must be unaltered, several non-Wiffle® Ball brand bats are legal (Franklin MLB Powerhouse, Easton Pro Stix, Louisville Slugger Replica). The imaginary base runners advance in concert with the batter. While 95% of the rules are instantly familiar to most competitive players, there is one rule that separates Lawnball from all other variations of the game. In Lawnball, every at bat lasts only one pitch. For both batter and pitcher, its one-and-done. The rule eliminates the ball-strike count for all practical purposes. If the pitcher misses the strike zone and the batter does not offer at the pitch, the at-bat results in a walk. A batter that swings and misses or takes a single pitch that hits the target strike zone is called out on strikes. Likewise, a foul ball results in a hard luck out. The “one-and-done” pitch rule allows JAL games to move along at a brisk pace while also reducing the amount of strain on a pitcher’s arm. WANT MORE ON JAL? READ "THE SCOUT: JETER LARSON"
For those who desire a brand of competitive Wiffle® Ball that remains true to baseball, the Lawnball rules can be disorienting. Hitters lose the ability to work the count and pitchers lose the luxury of nibbling on the corners. It is a different game for sure, but not necessarily a lesser skilled game than any of the alternatives. With less room for error, both hitters and pitchers are forced to make the most of each opportunity. As difficult as it is to recognize when a pitch is a strike and then put a quality swing on that strike when given three opportunities to do so, it is even more difficult when a batter is given just one shot at it. Lawnball may require a different set of skills than other versions of Wiffle® Ball, but it is a highly skilled game nonetheless. As one might imagine, with fewer opportunities and less margin for error every pitch in JAL takes on an added level of significance. The final two innings of JAL XVI championship – held this past August 9th – exemplifies the drama that the one-and-done rule brings to the game. In that championship game, the Castle Rock Rapids took an early lead on a solo homerun and padded their lead in the fifth via an RBI double. The Rapids pitcher – Jeter Larson, one of the league’s best – cruised through the game to that point and shut down the Missouri Express offense. With a chance to close out the game in the fifth inning, Larson began to overthrow and walked three straight Express hitters. While under other rules a hitter might take a pitch or two after three consecutive walks, Lawnball rules eliminate that possibility. Knowing that Larson is usually able to command his hard slider, the next batter for the Express went up swinging and singled in a run. The next hitter took a ball, tying the game with nobody out and the bases still juiced. Just when the game looked like it was getting away from him, Larson threw three straight strikes to escape the jam and force extra-innings. Over the course of eight pitches – no more than one minute in actual time – the Express went from probable victory to near certain defeat to gaining a new lease on life. In Lawnball, the momentum swings come fast and often. For that reason, JAL games tend to be far more spectator friendly than the average competitive Wiffle® Ball game. (If you are curious how that game turned out, the teams made it through six-innings tied at two before the Rapids’ Ty Johnson hit a two-run homer in the top half of the seventh. Larson fared much better in his second attempt at preserving a two-run lead, putting the Express down on three pitches in the bottom of the seventh to secure the title. Displaying a bit of showmanship, Larson planted a kiss on the ball before going into this wind up and blowing a fastball by the final Express batter to seal the deal. The Castle Rock Rapids (L:R Jeter Larson, Troy Flanagan, Ty Johnson) celebrate their JAL XVI championship. While the pace of the games and added pressure are obvious benefits of the one-pitch rule, just as obvious is the potential downside to the rule leading to a pitching dominated environment. While Johnson concedes that the general perception among players is that JAL is a pitching friendly league, he doesn’t believe it is that simple. During those times, Johnson has not shied away from implementing rule changes in pursuit of the right balance between offense and defense. For JAL’s first three seasons, for example, teammates pitched to each other using a “three pitches per batter” rule. When that led to too much offense, the league adopted the one-pitch rule while still having teammates pitch to one another. That rule lasted up until JAL IX when the organization moved to its current opposing pitcher and one-and-done formats. The implementation of competitive pitching led to a decrease in offense, so the league responded by opening up its bat selection to include the Franklin MLB Powerhouse, Easton Pro Stix, and Louisville Slugger Replica models in addition to the Yellow Wiffle® Ball bat. The mound distance was also moved back a few inches around the same time. Johnson believes that the next shift between offense and defense will come without the need for rule changes, as the JAL XVII rookie class is said to be heavy on quality hitters. On the great ball altering debate, JAL sides with the NWLA and other organizations that do not allow the Wiffle® Ball to be tampered with. When Coleman – who had prior experience in non-JAL Wiffle® tournaments – showed up in Castle Rock for the first time, he brought with him several scuffed balls which he used during games. Not knowing that scuffing was illegal in JAL, Coleman proceeded to mow down hitters until opposing players finally caught onto what was happening. The miscommunication was explained and Coleman switched over to the unaltered Wiffle® Balls, which did little to hamper his results. Coleman’s low sidearm delivery and riser would not look out of place in any fast pitch tournament in the country. Jeter Larson (Rapids) led his team to a championship in JAL XVI and is currently ranked as the league's top player. Quality Wiffle® Ball does not discriminate; not by the month of the year, geographic location or even by rules. The eyes of the Wiffle® Ball world have rarely – if ever – been fixated upon the Pacific Northwest. This winter, however, they should be. Not just because for the next few months JAL will be the only outdoor, fast pitch league in operation but because this inimitable league and many of its talented players are worthy of the attention. The league's unique structure and rules provide interesting insights into the different ways the game can be presented. And you never know, the next great West Coast Wiffle® Ball star – the next Chad Anderson, Jim Balian or Joel DeRoche – might just be playing in Washington State this winter. Fore more information on JAL, visit their website at www.jalwiffleball.com or follow them on social media @JAL_wiffleball and https://www.facebook.com/jalwiffleball.